Toss or Treasure? Are There Gems Hiding in Your Jewelry Box? - Hwatien Enterprise CO.,LTD. hether collecting jewelry is your passion or someone has gifted you a dusty shoebox full of old brooches, clip-on earrings and tangled necklaces, vintage jewelry can be a treasure trove of surprises. Even if you despise clutter and previously worn accessories, no one wants to be the person who tossed a valuable piece in the trash. Or maybe even worse yet— finds out that ugly necklace they sold for $5 was worth $50,000. I cornered industry expert Jill Burgum, Senior Director of Fine Jewelry for Heritage Auctions and the jewelry guru whose guidance has been prominently featured in print and on popular shows including Antiques Roadshow. Burgum offered up plenty of tips to help readers begin to sort through vintage jewelry confusion AND she gave me some surprisingly great news about an odd, old pin in my jewelry box. Read on and see if you have a hidden gem. Having been gifted old jewelry—some a tangled mess tossed in beat-up plastic bags—it’s confusing to know what to toss and what to hang on to. Any advice for a clueless person on how to begin clutter-clearing? I would suggest starting by separating all of the pieces as they aren’t quite so intimidating once the mass ball of knots shake out. Toothpicks, needles, skewers or straight pins can be very helpful in the untangling process, along with a good dose of patience. What types of vintage costume jewelry can have significant value? There are a number of important brands or makers in the costume realm. Some to look for would include Eisenberg, Trifari, Miriam Haskell, Napier, Coro, Chanel, Joseff of Hollywood, Hobé, Christian Dior and Elsa Schiaparelli, among others. Must these pieces be in pristine condition or should you hang onto a chipped set of potentially-valuable earrings? If the items are still in pristine condition, it is an absolute bonus. Most will display signs of wear, missing “stones”, loss to enamel, or other minor damage. There are specialists who can repair the jewelry for a price. Realistically, it might come down to asking yourself a few questions: (1) Do you intend to wear the item? (2) Are you interested in selling it? (3) How much is it worth either intrinsically or sentimentally? And, (4) what is the cost of potential repair? Every now and then, you hear the story of someone who gave away a precious vintage gemstone piece that they thought was costume jewelry. 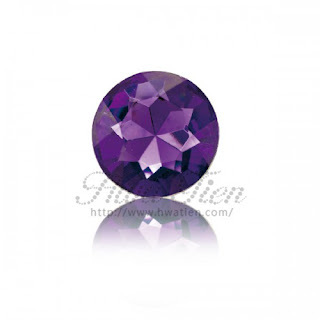 Are there some precious stones that look more ‘fake’ than others? Diamonds definitely top the list! Over the years I have personally encountered many instances where people thought they had a box of costume jewelry only to discover valuable diamond set jewels in the mix—the largest being a 5.00 carat stone. Heritage Auctions will be holding a Jewelry Signature Auction on September 25, 2017 in Beverly Hills (online bidding on ha.com). The highlight piece? An exceedingly rare 3.23-carat Fancy Blue Diamond, Diamond, Platinum Ring, estimated to sell for between $900,000-1,200,000. Do you have a favorite vintage jewelry story? Years ago, I inherited a vintage jelly belly brooch designed by Alfred Philippe for Trifari and was in the process of researching the designer when a gentleman visited me at an Antiques Roadshow event and presented an entire box of glittering costume jewels by the very same designer. It was a treasure trove and most definitely the highlight of my day. I’m pretty sure I was given my great grandmother’s dog head pin (or whatever it is) because it was quirky and no one thought it was valuable. I have held out hope that it is a hidden treasure that will allow me to toss a few “I told you so’s” at the family reunion. Can you give me any scoop on it? Sure, I’d be happy to help. For starters, the item presented is not a piece of costume jewelry! 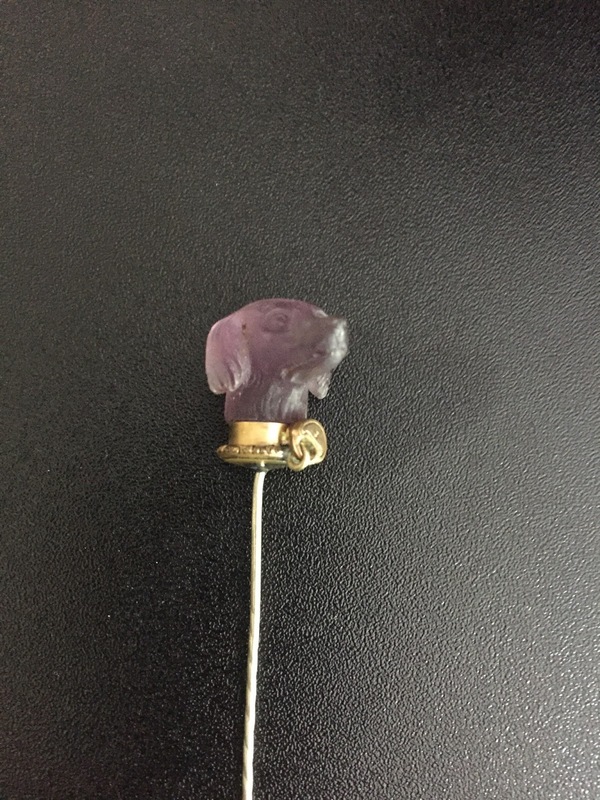 It is a stickpin composed of carved amethyst fashioned into the form of a hunting dog wearing a gold collar. It is nicely detailed and appears to be in very good condition for an item that is an antique—yes, this stickpin is over 100 years old. The only element that isn’t precious is the pin stem, which is crafted out of a white base metal common for the period, circa 1900. What you haven’t asked is what is the value of the stickpin? In the current collector’s market, the value would range between $250 and $500. Congratulations! Have you seen the latest wedding trend on Pinterest— bouquets made of vintage jewelry from family members’ jewelry boxes? Yes, I think it is a fabulous way to repurpose pieces while incorporating the concept of “something old, something new, something borrowed” into one’s special day. I love the concept, but couldn’t help but wonder— do you think this new concept has led to any hidden treasure surprises? Hopefully so as there is a lot of special vintage costume jewelry out there needing to be appreciated and enjoyed. If you were tasked to go on a treasure hunt to finding a valuable piece of jewelry for next-to-nothing, where would you go first? I’d start close to home and reach out to older family members, then consider yard sales and swap meets as excellent sources for treasure hunts.